Paul had slowed down in front of us and I looked around at Alastair and Chris we were all pushing as fast as we could to catch him. It was a hot, sunny day � steady force 5. The sea spray was warm yet cooling. I was enjoying myself so much that I had to concentrate on not making a mistake. 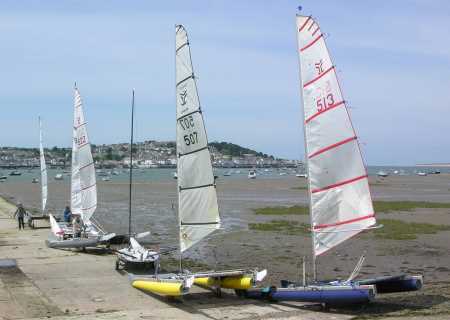 We were sailing in the beautiful Torridge estuary, alongside white beaches and sand dunes. We were heading for Westwood Ho! To a buoy near the breakers. Paul made it around the mark ahead of all of us and we ran more comfortable downwind. On the right was Appledore, flags flying across the sea front. Back to Instow, we arrived back at the lovely club house. I offered to buy all the safety boats crews a drink but they refused saying they were all free for them and we must have some sandwiches. In the panoramic club house we chatted and swapped stories with friendly people until it was time for Catapulters to retire to their B&B� for a short rest before we met up for a superb Thai meal. The next two days were similar with a bit of site seeing on the Cliff tops and a visit to Cleverly. Hoping for similar fun and sun at Bala. Other commitments reduced the first days entrants for the Nationals from six to three, arriving to the warm welcome from the North Devon Club, and excellent racing in a NNE breeze giving a good mix of conditions. The wind direction set a course pattern of a reach eastward down river, and then a beat north towards the wide estuary mouth. Race 1 Nigel Harrison, carrying a VHS receiver could hear the countdown to the reaching start and got away from Alastair Forrest, with Paul Ellis very late but able to cut across to follow. Out in the wider estuary, the wind was a steady 4 gusting 5, and all were on the wire for the beat out towards the mouth against the strong tide. Paul clawed back distance, while poor tacks and minor gear failure pushed Alastair to the back. Nigel could not be caught to record an opening first place. Race 2 followed immediately, with the wind now 5, with sustained 6 gusts. Alastair�s good start and a burst of reaching speed got him away, but on the beat Paul pulled up and away. Nigel and Alastair stayed close, Nigel with better reaching speed, but he was caught during the pounding beat. Paul showed a mastery of the testing conditions, stretching out and away for first. Race 3 on Saturday brought the sun out over Force 4 breezes gusting 5, all boats trapezing the beats. Chris Phillips had arrived, keen to test out Fred Woodley�s boat and Dacron sail, just purchased. Chris carried a spare hull from the sale and put Nigel back on the water. Race 4 followed immediately, with a good start by Nigel, until overhauled by Paul. A wind shift skewed the beat, and Paul�s ability to point up gave him a single board to the mark, leaving the others behind to tack to the mark in the strong tide. Running down, Nigel and Chris in close contention cut too close to the wind-shadow of the Appledore shore, letting Alastair stretch away. Chris and Nigel reached up the river neck and neck, with Chris turning so closely ahead that they tangled over the line. The Catapults headed out to sea again, the signals missed from the distant clubhouse that the shortened race was over. Paul worked hard at stretching his lead but the highlight of the second non-lap was Nigel�s recovery from a capsize, beating far out in the estuary. The hastening rescue crew were impressed by his rapid unaided return to the course. For the final race, Sunday brought lighter winds, again NNE. Alastair and Nigel were away down the first swift reach, but Paul overtook them and seemed destined to dominate until Nigel hauled up on him on the long beat, with Alastair falling back. All three went too close to the tidal overfall on the far shore, and Chris up the middle made a big gain. Nigel led Paul out to the estuary mouth, looking secure, and Chris had both speed and pointing ability against Alastair. Cloud cover dropped the breeze further, making tactics beating against the tide crucial. Paul elected to tack up the centre, gaining the mark and vanishing, while Nigel in a big shore board fell right back. Even leaving huge margins, Chris ahead of Alastair was swept down onto the windward mark, and Alastair was away. In the lightening breeze this long lap was the last of the championship.